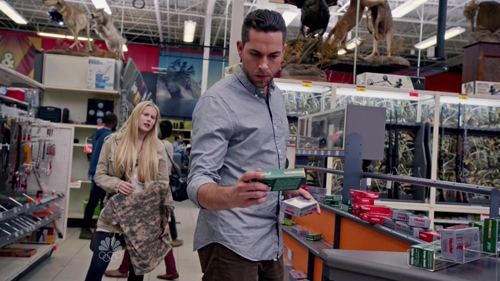 Following the disappearance of Noah, Malina (Danika Yarosh) and Luke Collins (Zachary Levi) take the opportunity to stock up on supplies. And we're not talking packets of mints and a few Coke's, either, it's mainly a gun. 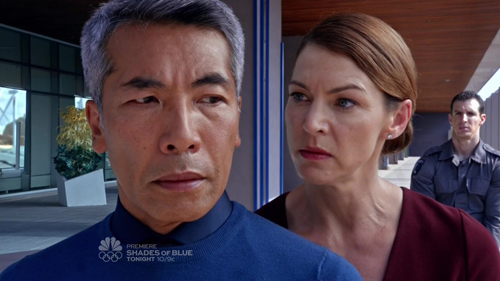 In the future, Erica Kravid (Rya Kihlstedt) chews out Hiro Kanagawa (Hachiro Otomo) for how his digital construct is slowly ruining her plan to save mankind, threatening to kill his daughter if there are any more mishaps. 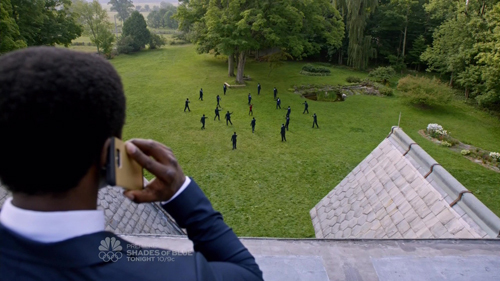 Back at Sunstone Manor, the cliffhanger ending with dozens of Harris (Clé Bennett) clones circling the manor, preventing Carlos (Ryan Guzman), Farah (Nazneen Contractor), Taylor (Eve Harlow) and René (Jimmy Jean-Louis) from escaping, was somewhat deflated. They simply headed back indoors and continued with their rescue plan, while most of the clones just seemed to walk incredibly slowly towards the manor. Seriously, this clone army work at a snail's pace. It also allowed Carlos to 'suit up' with his exoskeleton gear, and show off his manly chest to Farah. 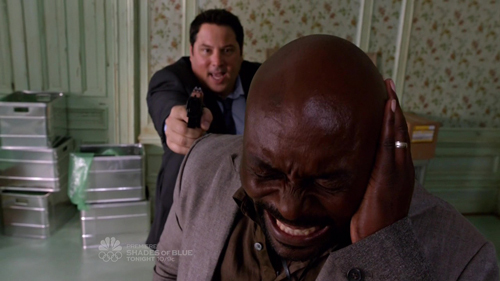 One thing that's always enjoyable about Heroes is seeing various people with superpowers get one over on each other, and there was a nice scene here where The Haitian tried to dampen Matt Parker's (Greg Gunberg) mind-control power, but was defeated when Matt fired a gun close to his ear and he lost concentration with the pain. I also liked the added clarity about why Matt is "a villain" now, and a lot of it boils down to his increased dislike of hearing people's thoughts 24/7, so at Sunstone he gets to be the leader of a peaceful commune and genuinely thinks it's all for the greater good. And a free ticket to the future for his family doesn't hurt, either. 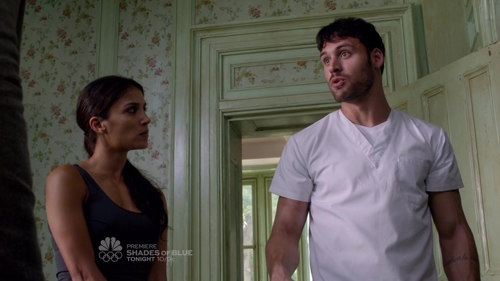 Managing to get away, now angry after discovering he's not on Erica's list of EVO evacuees, Matt took Taylor hostage and used his powers to discover she's secretly pregnant and keeping that fact away from her mother in particular. 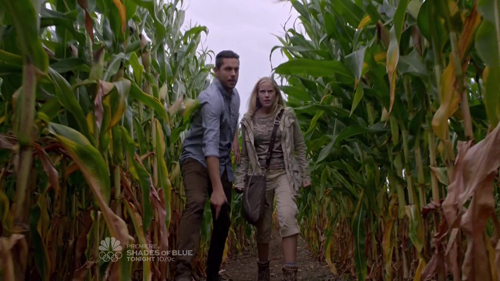 Luke and Malina were located by some Harris clones on the road, so had a North by Northwest sequence in a corn field. Nathan (Robbie A. Kay) is still working with Erica now, it bears mentioning. I do like how the antagonist of Heroes Reborn has a persuasive argument, which causes people to change allegiance in a plausible way. 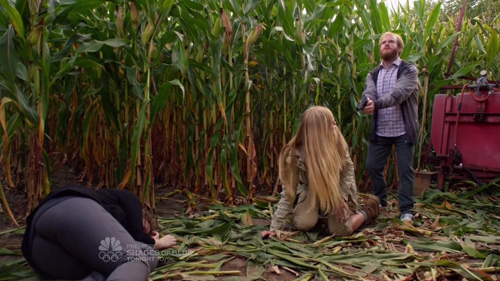 Also pursued by Quentin Frady (Henry Zebrowski) and his power-dampening sister Phoebe (Aislinn Paul), Luke manages to subdue the latter to save Malina, and they all reach a compromise. Quentin reveals where the Gateway to the future is, in exchange for Luke letting his sister live. 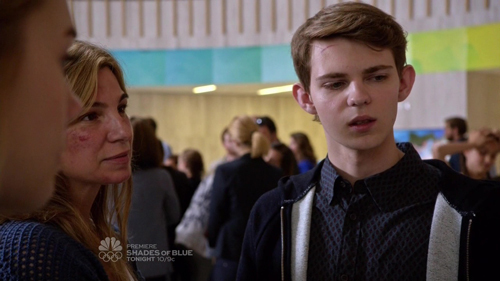 In the present, Nathan's reunited with his mother and sister, who are broadly in agreement that he should be helping Erica with her plan. Back at Sunstone, Katana Girl arrived from the future and was set upon by the Harris Clones (who have advanced about six yards since the episode started). 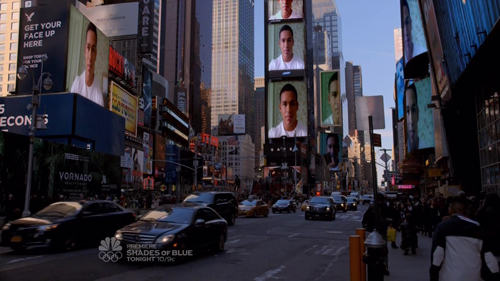 Inside, Carlos and Farah manage to rescue his nephew and free Micah Sanders (Naah Gray-Cabey) from his prison, but at the cost of Father Mauricio's (Carlos Lacamara) life. RIP, father. 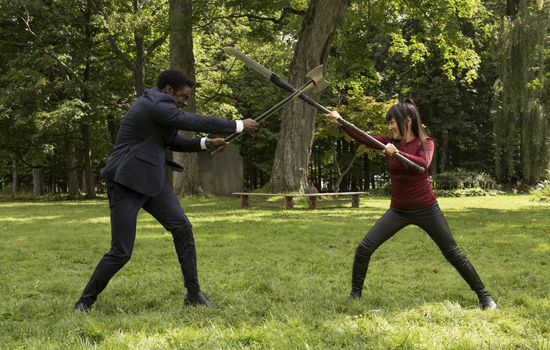 Katana Girl is tearing through the clones, but Harris Prime decides to get involved personally with one-on-one combat; it's Japanese martial artist schoolgirl vs. African-American axe-wielding clone-maker. 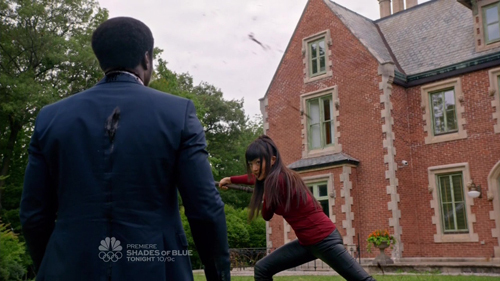 Quite a cool little fight on a lawn, with a great ending as Katana Girl manages to spear Harris by ramming her weapon through her own body now it's beginning to lose its form. She also decapitated him with the kiss-off line "don't get ahead of yourself", which was fantastic. Sadly, she later vanished and it was the only loss of the episode I really felt. RIP, Katana Girl. The point of releasing Micah becomes more obvious (beyond, y'know, helping a young man who's been wired up to a machine for months), as he broadcasts his anti-Eric message around the world using his ability to manipulate electronics. Sensing the collapse of her entire plan now the world knows EVOs aren't to be feared and weren't responsible for the Odessa explosion, Erica recruits everyone's favourite character, Joanne Collins (Judith Shekoni) to stop Malina and her estranged husband Luke. Uh-oh. There are only two episodes left and now the 'heely' (the weird term they're using for a solar flare) has been spat into space from the Sun's core, and is making its away towards Earth. This wasn't a bad episode. 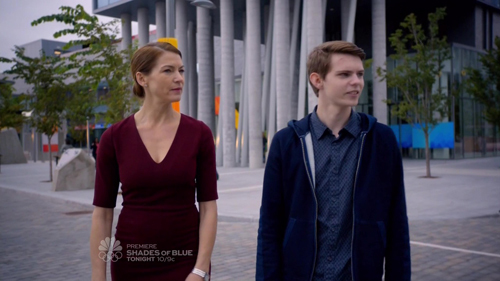 I'm still enjoying Heroes Reborn a fair bit, and think it would've gone down much better with mass audiences if this storyline had aired as the show's second or (redemptive) third season. It's fixed a lot of problems, and those that remain are almost charming. It's a fun show and nothing to get worked up about; it's just a shame few people have given it a chance, and things have moved on with the genre. Maybe it's been too much of a throwback? 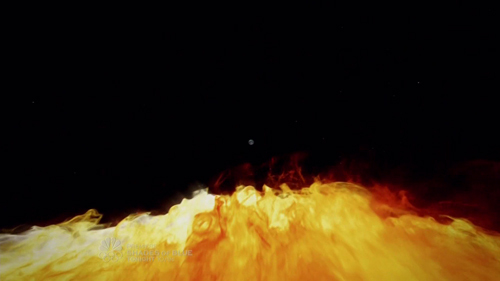 Should Tim Kring have reinvented the whole idea more, instead of giving us a good example of a show that was consigned to history? It's also a real shame the momentum of the story has been dealt a terrible blow, with that ridiculous wait over Christmas for the remaining three episodes. Why does U.S TV do this? A few two-parters mid-season weren't possible? Couldn't it have started earlier or later in the year to avoid the gap? I struggled to remember exactly what was going on in a few of the stories, or what the current state-of-affairs were for characters like Tommy and Katana Girl. The whole show will probably play much better when it reaches DVD and VOD. What did YOU think? 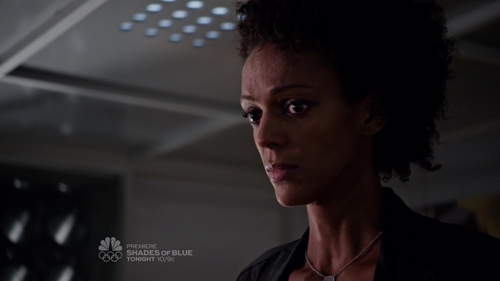 Not much response to these recaps; hopefully not because of how they're being put together! I just thought it would be nice to cover Heroes, in what's now the blog's 10th year, as it was a show much of DMD's success was built on back in the mid-'00s.